In Stone | Rock Climbing in Truckee and Lake Tahoe. Family Adventure, Self Discovery, Team Building and more! Welcome to In Stone Rock Climbing! Rock climbing is often mistaken for a dangerous sport that requires brute strength and a fearless attitude. Although it appears very strenuous, you'll quickly learn just how safe and mindful this wonderful sport really is. Your instructor and guide Chris Baumann will design a course to match your ability and can accommodate almost any fitness level. Learn to rock climb at Donner Summit—heart of the Northern Sierra—in a scenic alpine environment. Conveniently located just off Interstate 80 near Truckee, California in North Lake Tahoe. Just 45 miles from Reno and about an hour and a half drive from Sacramento! 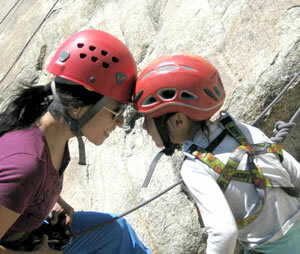 Ask us about winter rock climbing in Joshua Tree! Operating on a non discriminating basis in partnership with Alpine Skills International under special use permit from Tahoe National Forest.